Hello folks – am back at my desk after delivering 23 seminars around the country during the past 6 weeks. They covered direct marketing using offline digital tools, online digital and other traditional channels. Almost lost my voice. One thing you get to enjoy when staying in hotels is to read the printed newspaper over breakfast – not commonly done at home these days. While turning the page in Townsville last week, I was reminded of an incident from last century – that’s the 1990’s. I wrote a full-page four-colour press ad to sell an environmental statistics book published by the Australian Bureau of Statistics. This was not your usual hard-cover coffee-table book with glossy pictures of rainforests and endangered species. No folks, this was a few hundred pages of recycled stock, chock-full of statistics and data designed to cure insomnia. 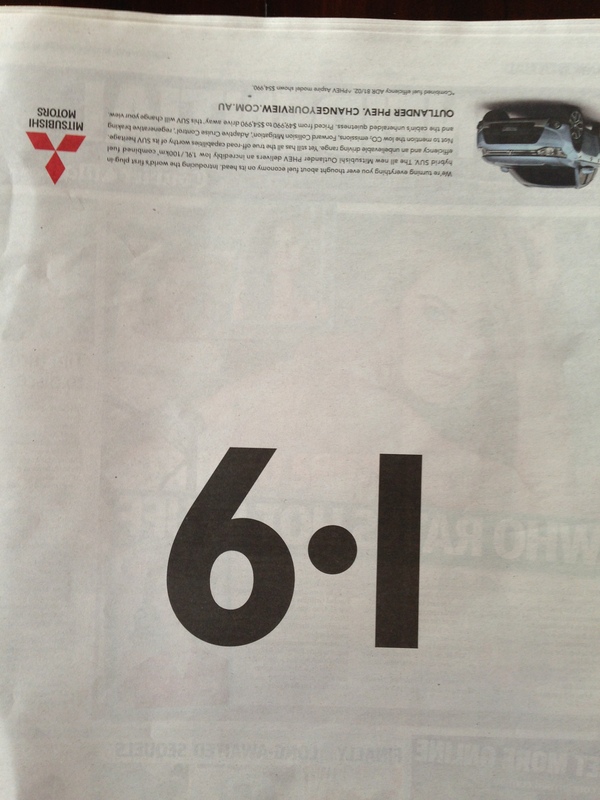 The ad was booked to run in The Australian newspaper – a broadsheet for those who don’t know it. There were only two ways to order the book – by fax or mail. I put an extremely light blue tint in the coupon to help differentiate it on the page and to match the blue/green colours of the environmental theme. We sent specific instructions to the newspaper about how light we wanted the tint. On the day the ad ran I opened the paper and nearly threw up my breakfast. Despite our instructions, the production team at the paper decided to increase the percentage of tint, so it really dominated the page. They thought they were doing us a favour – but of course they were destroying our ad. That’s because any faxed orders could not be read, as the coupon returned as a solid black when it spat out of the fax. In short, it was an (environmental) disaster. So imagine my surprise last week when I opened The Australian over brekkie. I thought the production team had come out of retirement. There before my eyes was an ad printed upside down. What a disaster I thought. The advertiser would be asking for compensation on that clanger. Yet the following day I was reading another paper at the airport during the standard delay for the flight. I assume that’s why the newspapers are free at the departure lounge? I turned the page and here was a full-page ad printed upside down. I’d kept the original ad to write this blog, so I checked the two ads against each other. They were for the same brand – apparently the upside down ads were meant to be, well, upside down. People are supposed to turn their broadsheets 180 degrees to read the ad – how inconvenient and how bloody confusing. This is not very creative by the way – to be creative the ad would have to give a reason to consider turning it upside down. But it didn’t – there was just a number printed in the middle of the page. Why would I risk knocking my brekkie off the table to read the ad? Why should I turn my newspaper upside down? I took a wild punt and guessed that somewhere in the copy there would be a statement about “change your view”. And I wasn’t disappointed – it’s the obvious thing for something like this and has been done dozens of times before to sell spectacles, conference venues, hotels, holidays and more. But this ad has gone further – it comes with a website about ‘change your view’. Maybe they should change their view and realise that confusing people, or frustrating them is a fast way to failure. Unless the pay-off for doing something out of the ordinary is sensational, people won’t do it, or worse still, will do as you ask and get frustrated at the result – as I’m sure some people did turn their paper upside down and even visit the site. But is it any wonder people are reading newspapers on tablets? If the upside-down ad craze takes off, it’s a lot easier to turn the digital pages 180 degrees on a tablet or smart phone. I’m off to invent a spinning App that turns the ads around automatically it detects them on my digi-reader. It will save the humans tilting and turning their mobile devices. That’s of course after I finish reading the weekend papers.